Looks like there’s a major hurricane exodus amidst bloggers for spiralling their position in the game of being social media influencers instead of continuing with blogging. Only god knows why, I don’t know why, seemingly, bloggers are not too keen in blogging anymore. True enough, obviously, enthusiasm has already plunged deepest down because making a name in the social media world undoubtedly is the priority. Of course. Wanna know how they do it? Well, cheating by following and then unfollowing, believe me, is still the dirty league for building as many Instagram followers. Some bloggers, obviously too, are simultaneously speeding towards tubing their bulbs alertly in YouTube ranking. What’s actually going on in the virtual world, are you asking me? Beats me! Okay, okay, I think I have figured out. Number of followers literally is the number crunching for drawing sponsors attention. The battle is certainly rocking flashing. Best of luck to each one of them, meanwhile, I am still faithfully enjoying writing. What’s up my sleeve today? It’s another beauty game changer for our beauty catcha. Do I have to mentioned what's its gonna be? Oh please beauties. I have given you the clue right? 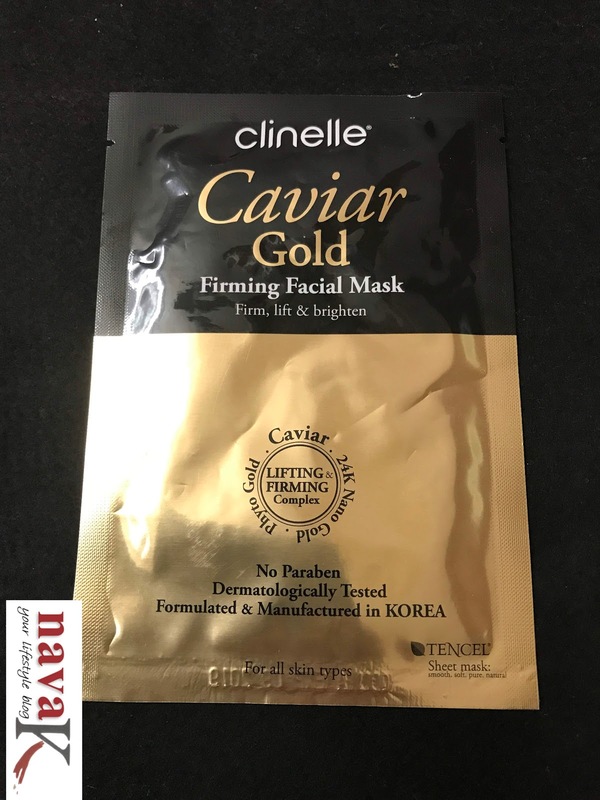 Clinelle Caviar Gold Firming Facial Mask right? Of course (W.H.P Charcoal Mineral Mask & Active Double Action Mask) . Honestly, for me, I am always ecstatic about buying and trying sheet masks. Aplenty choices, mind you. Between the various types from known and unknown brands. Head over to the pharmacies or beauty stores and I bet you will go off your rockers like me on which to opt for. 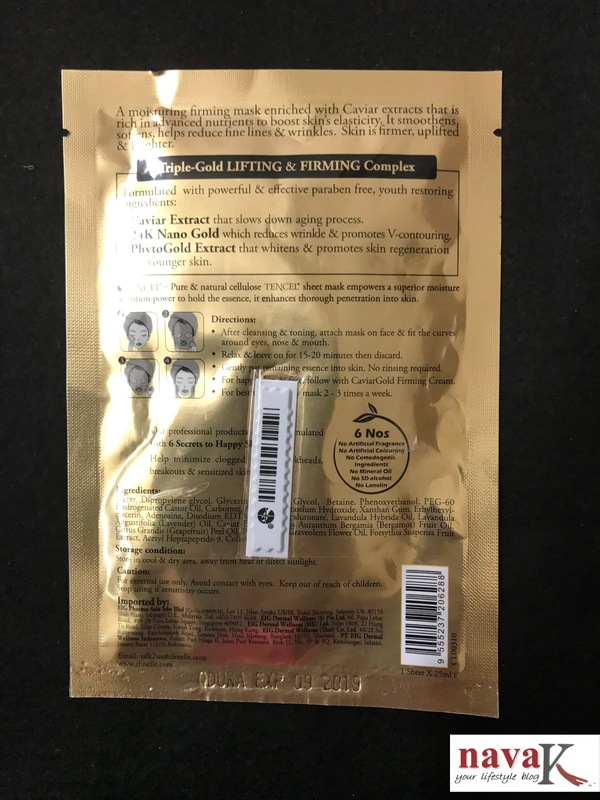 For me, yes me again, compared to powder masks (Banjaras Turmeric Mask), I am truly a beauty lover of sheets masks, even creamy masks are not too bad either ((Sephora Night Mask, Annie's Arbutin Mask & Skinfood Black Mask), which potentially are better suited for my 50’s skin. So far, so good. None of the sheet masks I have tried had failed me. Maybe not all that fantastic, yet, in no way any of it had ruined my complexion. Additionally, I like the fact that I can store sheet masks in the fridge for their cooling sensational burst when applied and while their properties work on my skin. Having said that, must I still repeat myself as a parrot again and again on how to use sheet mask? Lets just cut the crab. Can we? Even a three year old young doll can tell you. Don’t believe me? Ask the young dolls who are being beauty trained by mothers who are gearing their daughters for snatching the beauty crown as soon as puberty strikes. 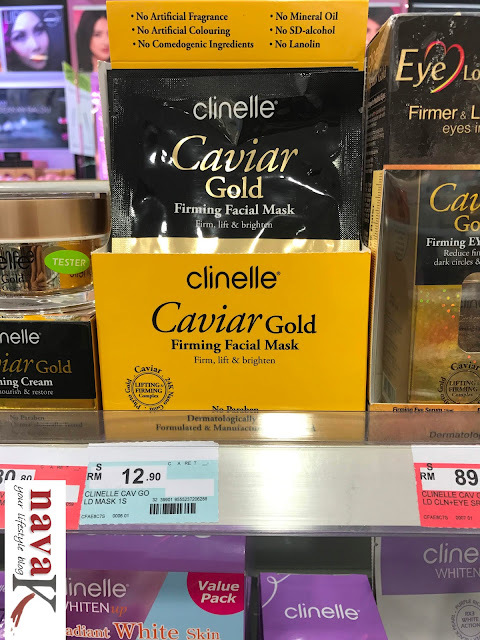 Therefore, how about we keep it out-rightly lean and mean on Clinelle Caviar Gold Firming Facial Mask which I really couldn’t resist picking up at Watsons. Simply irresistible. Its so close to a natural organic mask until I didn’t mind paying RM12.90 and for pampering my skin during weekends. Generally weekends. Been like that, maybe because when I was working full time, I felt that I should walk into my office on Monday with a bright and sunshiny skin instead of like those who don't even bother bathing in the morning. God! Trust me, the pong can be a killer. 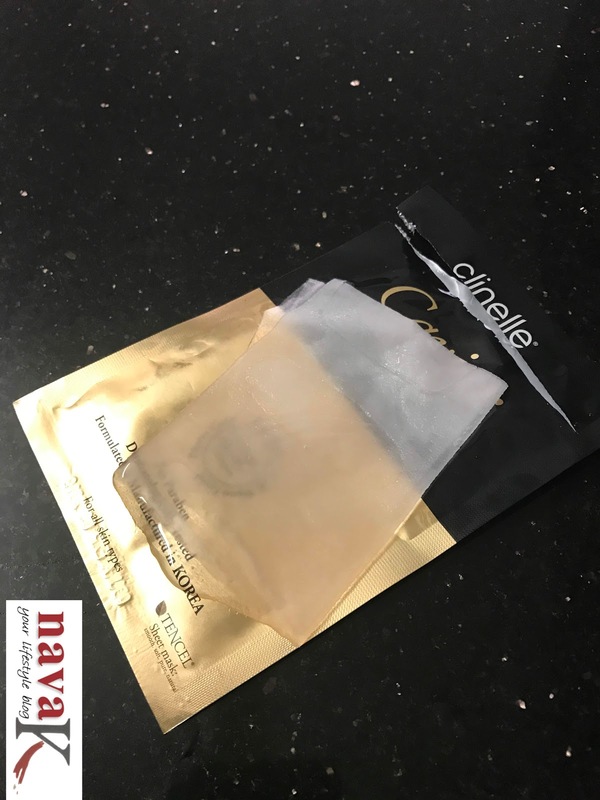 Clinelle Caviar Gold Firming Facial Mask is truly one of those super soaking and doused in goodness nutrition solution serum/liquid mask. Gently stretch for opening it prior to allowing it to sit on my 15 minutes and then after removing, I massaged its sticky residue for deeper penetration. Walla! It did perk me up by punching kicking aside my stress and tiredness. Bang! Clinelle Caviar Gold Firming Facial Mask, yes, almost instantly woke me up. Notably, by hydrating and leaving me clear and clean. However, to tell you the truth, I didn’t notice any lifting and firming. Not even a tiny bit. Unless maybe if I follow up by using it again for another two or three times? Still, I really am unsure, albeit I can vouch that even with one up use, it will intensively smoothen your dull, dry and combination skin without breaking or causing your skin to itch while and after using. Clinelle Caviar Gold Firming Facial Mask I believe is conclusively of a higher grade compared to those sheet masks you pay within RM5.00. You should give it for enlivening your skin. I think once a week will do. Otherwise, I'm afraid that its super rich formula may break you up. seems good mask! effects are visible . 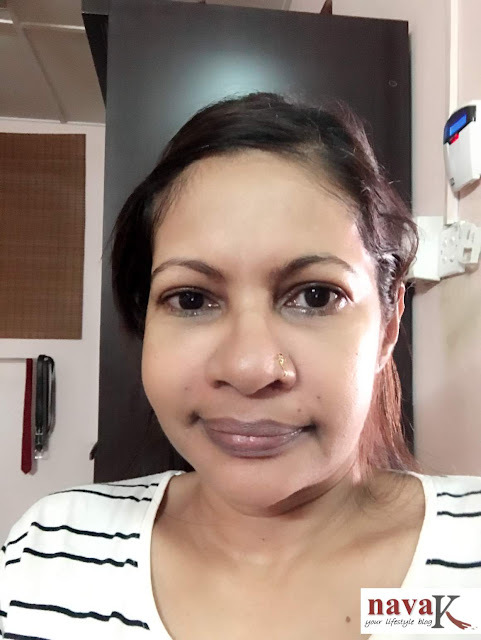 I am your new follower #601, hope you would like to follow me back.please visit my blog. Honestly Nava..they really MUST cut the crab already too many times have you explained. Fast track to the new age wishy washy roundabout fast forward to the blended reverse of these unfaithful up in here bloggers becuase they don't care as much as you do.All the fakes are just too easy to be spot looked when you see their online agendas. I tell you all want to be Babas Masala Thule and not their own genuine selves. Keep up the great work and you look great as always. Luxurious product. Nice that it's natural and it gives you that beautiful glow.